DRIVEN: 2019 Nissan Leaf - second-generation electric vehicle now revamped, but how "normal" is it? Home » Cars » DRIVEN: 2019 Nissan Leaf – second-generation electric vehicle now revamped, but how “normal” is it? In recent months, several carmakers have announced comprehensive plans to introduce a range of electric cars in order to promote a greener form of motoring, while also satisfying increasingly demanding emissions regulations. For instance, the Porsche Taycan is due in September this year, while BMW already has its i3 and will add three more EV models to its line-up within the next few years. Over at Audi and Mercedes-Benz, both companies unveiled their own all-electric SUVs in late 2018. Lest we forget, Tesla has its S3XY range of cars as well. However, while these carmakers are just beginning to, or have already introduce(d) the first generations of their EV offerings, Nissan has already moved on to the second-generation of its Leaf as of September 2017, which takes over from the first-generation model that first came out at the beginning of this decade. 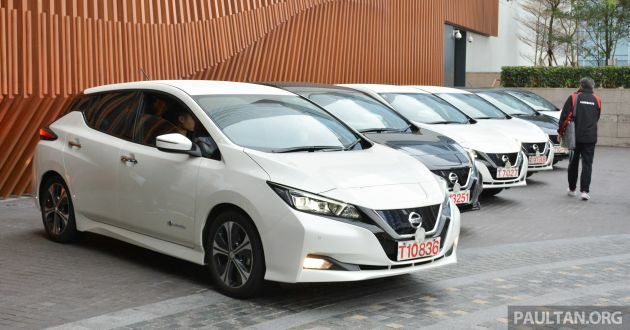 In 2018, Nissan announced that it will launch the latest Leaf in additional markets across the Asia and Oceania region, including Malaysia, over the coming months. 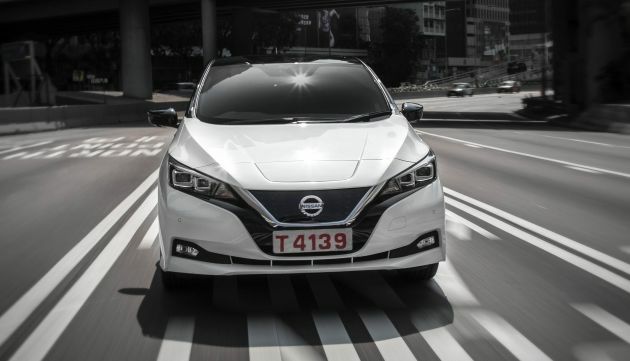 In preparation for this, we were given the chance to have a go in one during the recent Nissan Futures event in Hong Kong to see just what the mass-market EV has to offer. If the first-generation Leaf was a little comical in the way it looks, the second generation is anything but. With inspiration from the IDS Concept and the fifth-generation March/Micra, the Leaf now looks a lot more like a “regular” mainstream car, and dare I say it, a rather sporty one at that. Standout cues include the brand’s signature V-motion grille with a blue-tinged 3D mesh motif, “boomerang” style light signature and taillights, as well as a floating roof with “kinked” C-pillars. Compared to the bulbous look of the original, the new car is certainly a lot less divisive in terms of its design, and should have a wider appeal. Similarly, the interior has been simplified from the first generation. Gone is the dual-tier setup for the instrument cluster, replaced by a digital screen and analogue dial pairing within one binnacle. The screen itself is without novelty, merely showing if the powertrain is regaining energy or using it, plus the available range, the battery’s state of charge and if other vehicle functions are enabled. In other parts, the dashboard itself is a lot more upright, and the centre stack now meets with the centre console, displacing the cupholders further down the line. The oddball gear lever is retained here, albeit primarily finished in black, with the Eco mode button and e-Pedal toggle switch located just ahead of it. Getting into the Leaf, the first realisation is a rather high seating position even when the height adjuster is set at its lowest. This is a result of the heavy batteries being placed in the centre of the body, which is done to provide better stability for the chassis. Additionally, the steering wheel can only be adjusted for rake but not reach, which made setting an ideal seating position a little tricky, at least for me. As for second-row seating, there was sufficient knee- and headroom for my 170-cm height, while further rearwards in the boot, the loading space is a little sunken in as a result of the batteries. It’s usable but you’ll have to apply a bit of Tetris artistry to get some of your cargo firmly in place. Firing up the Leaf is anti-climatic, as you’d expect of an electric car, with just a notification to tell you that the car is ready to go. From there, just slide the round gear lever into D, release the handbrake, and you’re off. It’s all very “normal,” and aside from the whir of the electric motor, there isn’t much to hear. On that note, the EM57 e-motor at the front makes a modest 148 hp (110 kW) and 320 Nm of torque, both a 38% and 26% improvement over the final iteration of the first-generation model. 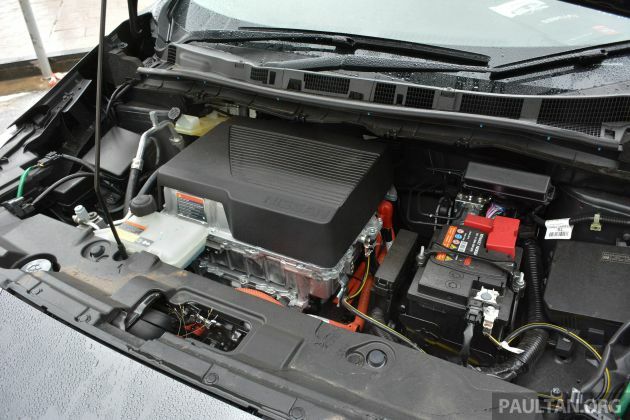 Said e-motor draws power from a 40 kWh battery, which Nissan claims will provide 400 km of range (Japanese JC08 standard) – a 62 kWH option is available in some markets. This is a major step up from the maximum 30 kWh unit used in the first-generation model, and it is largely the result of a new electrode material that allows for a greater number of lithium ions to be charged without having to increase the overall size of the battery. As with most electric cars, the Leaf comes with regenerative braking to help recuperate some energy under braking to restore some range. In the Leaf, the intensity of this function can be altered depending on the mode of the “transmission,” and if additional functions like Eco mode and e-Pedal are engaged. When the “transmission” is in D mode, the car doesn’t feel any different from a regular car – it’ll still coast along upon lifting off the accelerator with minimal regenerative braking in play. Slotting over to B mode intensifies the regenerative braking, which makes deceleration more apparent to recover more energy but you will not come to a stop. As you can tell, these modes only affect deceleration via regeneration braking. Bringing the Eco mode into play, which is independent of the “transmission” modes, the acceleration of the vehicle is affected instead. It’s self-explanatory this, as having the mode on withholds the acceleration performance until you fully depress the accelerator pedal, regardless of whether you’re in D or B modes. 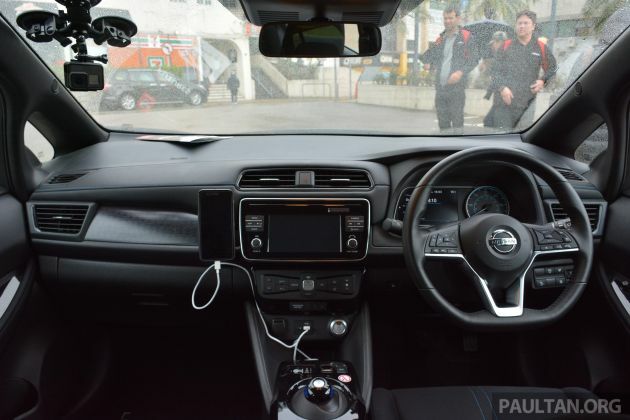 The most intriguing and most likely to take some time to get used to is the e-Pedal, which forms part of Nissan’s Intelligent Driving technology suite; the other systems being ProPILOT and ProPILOT Park – both were disabled during our drive. With the e-Pedal, almost all driving can be done with one pedal. Now, this isn’t a world’s first because other models have had such a system in their own EVs as well. However, as a first time user of such a system, it certainly did catch a first-time user like myself off guard. You engage e-Pedal via a switch in front of the round gear lever, whereby an icon pops up in the digital instrument cluster to let you know its active. The chaperone in the car assured me that within a few minutes of trying it out, I’d be a natural despite the moderate traffic conditions. He wasn’t lying. Setting off is rudimentary, as you just need to depress the accelerator like you would usually do. However, upon lifting off the pedal, the regenerative braking comes on at its strongest, rapidly decelerating the vehicle and bringing it to a stop. The first time it happened, my natural instinct was to reach for the brakes as I couldn’t assess just how much the car was being slowed down by. After a few repeats of this exercise, things became more familiar and my tendency to reach for the centre pedal faded away. After 15 minutes with the e-Pedal engaged, it all felt very natural, and I left the mode on all the way back to the starting point. You might be wondering why Nissan even bothered with such a thing, so here’s my input on this. With the e-Pedal, there was less fatigue while dealing with Hong Kong’s traffic, as I didn’t need to keep moving my right foot from pedal to pedal. Additionally, the vehicle won’t creep forward even after you come to a stop, so you never need to hold on the brakes, or worse, accidentally slip off of it while doing so. It’s something you have to try for yourself to better understand but once you get the hang of it, it’s likely something you’ll welcome. The only time I had to disengage the mode is on highways where the strong “braking” (about 0.2 g) wasn’t welcomed. Nissan says that with the e-Pedal, brake pedal usage is down by 90%, and it assures us that other motorists won’t be alarmed as the brake lights come on the moment you lift off the accelerator pedal, just like as you would when using the brakes. Of course, you can overlook this function entirely and drive the Leaf like a normal car, but it’s certainly worth a try. In terms of performance, the instant torque from the e-motor means acceleration is rather brisk, with Hong Kong’s speed limits of around 50 to 80 km/h easily reached (zero to 100 km/h takes about eight to nine seconds). For most driving applications, this level of performance is more than sufficient, with a little left to be desired when overtaking on the inner city highway. As for the ride, the Leaf comes in two configurations with a firmer suspension tuning for European markets, which is what we sampled. 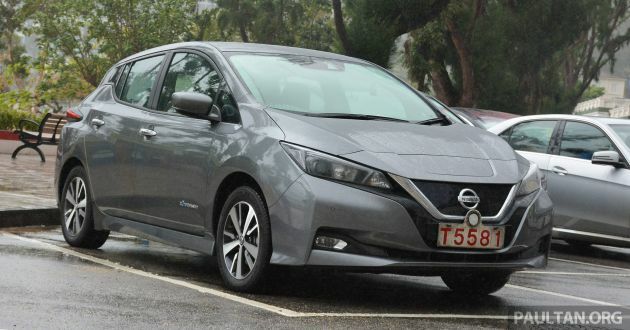 Around the relatively smooth streets of Hong Kong, the Leaf remained mostly comfortable (and quiet), with only the odd roll over a manhole cover providing moments of discomfort. We were told that a few of the test cars there came with a softer suspension setup for countries in Asia like Japan, but we didn’t get to try them out during our time there. 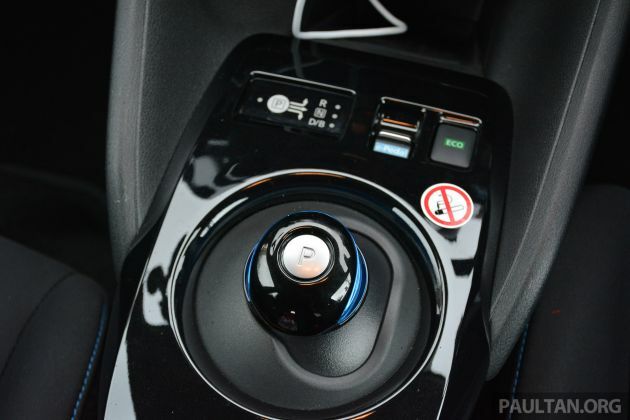 Other aspects like the Leaf’s electric power steering can best be described as light and progressive in feel, perfectly suitable for city driving, but a little lacking in precision. 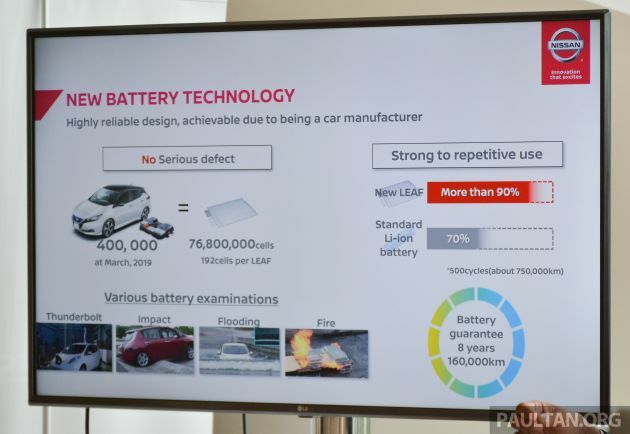 Battery safety and reliability are also important aspects for Nissan, and it claims that since the Leaf was first launched up until now, there have been no serious defects with Leaf batteries. It also claims that with repeated use of 500 cycles (about 750,000 km), its batteries are able to still maintain a 90% charge compared to others that can only muster up 70%. If words aren’t enough convincing, the Japanese carmaker adds that all Leafs, regardless of market, will come with an eight-year/160,000 km battery guarantee. By quelling concerns about range and battery reliability, Nissan hopes its efforts will help encourage the uptake of the Leaf. Like all batteries, you’ll need to charge this one up too. 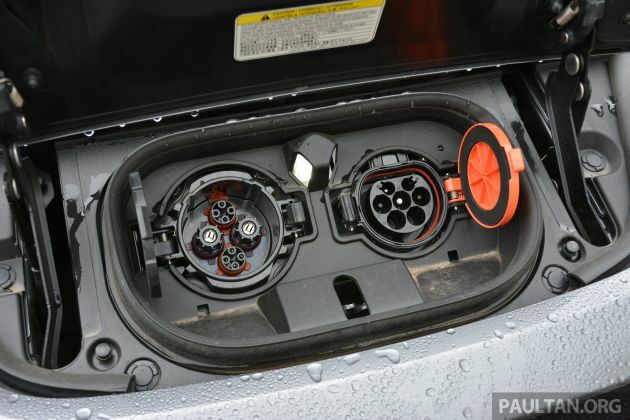 As standard, the Leaf comes with a 6.6 kW on-board charger and two types of connectors located at its nose – Type 2 (AC charging) and CHAdeMO (DC quick charging). In the case of the AC charging, with a wallbox or public charging station (rated between 7-22 kW, 240 V), the time it takes for a full charge is between five and seven hours. 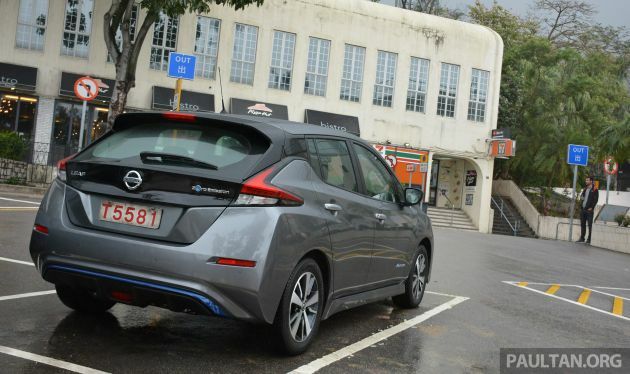 Keep in mind that even when connected to an AC charger with a higher maximum output, the Leaf will only be able to accept up to 6.6 kW. Therefore, if you plug a Leaf into 7-kW or 22-kW charging stations like those prepared by ChargEV in Malaysia, you’ll get roughly the same charging times as those claimed by Nissan. However, with a lesser 3.7-kW charger, or a typical 240 V/13 A plug normally used in homes, it’ll take longer at roughly 10-12 hours. A much faster option is DC quick charging, which requires the use of the Leaf’s CHAdeMO charging port. With charging support for up to 50 kW – we have those in Malaysia – plugging the Leaf into a public fast charging station significantly lowers charging times to within an hour. Although the ProPILOT functions were disengaged during our drive, there’s still a need to mention that the Leaf comes with a bevy of advanced safety technologies. It has four cameras and 12 sonar sensors (four each on the front, side and rear), supporting features such as an around view monitor, single-lane autonomous driving, parking assist, autonomous emergency braking and others. Just like the way it moves, the Leaf has become a silent champion for EVs, all without that much fanfare. Unlike the cars mentioned in the second paragraph, Nissan’s approach with the Leaf prioritised affordability and real-world requirements. While some of us are all hyped up on EVs that’ll do the century sprint in a couple of eye blinks, the reality is regular people just want a simple, blue-collar car that runs on electricity rather than fossil fuels, and the sales numbers seem to reflect that. Earlier this month, sales of the Leaf surpassed 400,000 units worldwide, making it the first electric car in the world to do so. With the new Leaf, Nissan has further improved on giving what environmentally conscious people want by providing it with better performance, more appealing looks and a widened feature set. The Leaf does make a compelling case for itself by being perfectly “normal,” which helps ease the transition for those looking to enter EV ownership. Let’s just hope the governments in our part of the world will do what’s necessary to make sure EVs like the Leaf are not too far beyond our reach. Edaran Tan Chong Motor (ETCM) has already stated it plans to launch the second-generation Leaf in Malaysia by this year. The first-generation Leaf was sold in Malaysia previously, but it wasn’t exactly a major sales success. I hope our new clever Government give incentives to buy EV cars. Don’t be like the previous Government and MAI – they told us Government was moving towards EV cars and encouraged people to buy EV cars. Then they told us to buy the First Generation Leaf at RM250k!!!! Hello, who got RM250k lah? I hope the new clever Government be like the UK Government. In UK, people who buy the Leaf get 50% rebate from the Government. In other words, the car is like half the price. We need some good brains in MITI and Putrajaya to formulate incentives for people to move forwards to EEV, EV and Hybrid cars. This is because the world is moving towards EV. If we don’t catch up, we will be left behind! i got news for you bro. i think u are forgetting about the new ‘protiga’ by gov, which i heard is focusing on EV/alternative energy. With this new protiga, surely govt need to protect it from the evil of established EV players the market. So surely new leaf will not cost RM250k, that would be insane, in fact i think it will be RM300k. Got to protect protiga bro. Ready for mass production when the market is ready. And? It has been said one of the best e-car in europe country..
Or a still prohibitive RM100k? Or a more tolerable RM50k?.hopefully solid state battery will be matured by then. Then maybe only RM25k or less to change it. Happy motoring now and forever! “Firing up the leaf is anticlimactic” and “aside from the whir of the electric motor, there isn’t much to hear”…I mean, what does one expect from an electric car after more than ten years on the global road. Either the writer has some unusual expectations of electric cars, or he is still stuck in the “Top Gear bashing electric cars” mentality. “assures us that other motorists won’t be alarmed as the brake lights come on the moment you lift off the accelerator pedal”… a real improvement here as current hybrids with regenerative braking when pedal lift off has no warning indicating slowdown from the regen braking. Take note Honda and Toyota! Then again the regen can’t be controlled. It’s fixed. They try to emulate it like a heavy kerb weight ICE car coasting to stop so they don’t need to trigger the brake lights. You don’t even have to brake on uphill slopes. . Abit dangerous if the person behind not paying attention.